Girls in the 28th Wimbledon Guides and Senior Section are usually able to take their Duke of Edinburgh Awards through the unit. However, we can only do this thanks to the extra time given by the leaders and parent volunteers, so please be patient with us if you need responses to queries etc! You can find out more about the Duke of Edinburgh Awards on the DofE website, which has extensive advice on the various sections of the awards and information for parents. 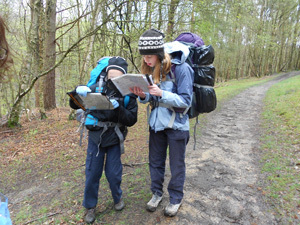 You might also find this Girlguiding guide to DofE useful. There are restrictions on the proportion of girls aged under 14 years old who may take part in the expeditions for the Bronze award. This has caused problems for us in the past when we have had a lot of Year 9 girls born in the summer term and summer holidays. We will do all that we can to help Year 9 girls start their Bronze award with their peers, but there is nothing we can do to change those rules. Similarly, there are strict guidelines on the ages at which girls can start the Silver and Gold awards, and this may also affect when they can do their expeditions.